Phra Apichart Punnajanto, the 30-year-old head preacher at Bangkok's popular Marble Temple, tries to suppress a smile as he explains how very angry he is. The baby-faced monk pulls out documents, one after the other, and spreads them across the table. Next to him, a friend whom he has deputized to memorialize this interview snaps away on an expensive smartphone. 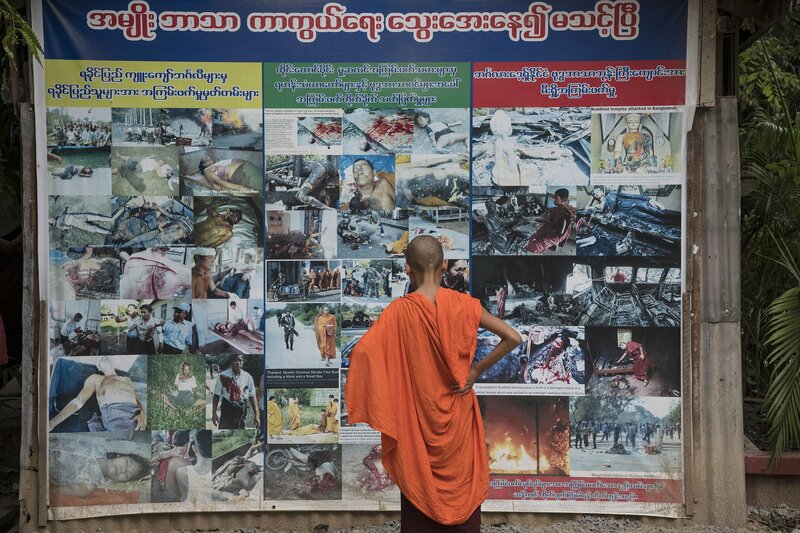 Late last year, Apichart made headlines here after calling on his social media followers to burn one mosque for every Buddhist monk killed in the deep south. The Thai government moved swiftly to shut down his Facebook page, but the controversy has only increased his popularity. In the months since, thousands more have flocked to follow him on social media. And for every user attacking him for "really divisive" rhetoric, there are two urging him to "keep fighting." The attention thrills Apichart, who says he studied communications in college and calls his social media foray an exercise in “journalism written with hate speech.” His Facebook page is filled with gruesome photographs that purport to show Buddhists hacked in the head with machetes, immolated and shot by southern insurgents. Many are from years-old incidents, widely reported by local and international news—though Apichart says he is the only one printing such information. He insists there is a conspiracy among Thailand’s newspapers to bury the “truth” and says his photos come from an intelligence officer (though a quick reverse-image search shows they have long been circulating on anti-Muslim Web pages). “What I want to do is to make Buddhists who are still sleeping and think things are beautiful, I want to make them aware of what’s going on. Muslims aren’t trying to invade just the three [southern] provinces; they are trying to occupy the whole country,” Apichart says. Increasingly, monks in Thailand are looking to their counterparts in Sri Lanka and Myanmar—two places where Buddhist ultranationalism has spilled into anti-Muslim violence. In February, Thai Buddhists hosted a conference on “Crisis in the Buddhist World.” A Sri Lankan monk talked about future threats to the religion, while the president of Ma Ba Tha led a session on laws to protect Buddhism before receiving a leadership award. “We worry about the Muslim invasion in Thailand,” says Banjob Bannaruji , a professor at the Buddhist Mahachulalongkornrajavidyalaya University and head of the Committee to Promote Buddhism as the State Religion. Last year, as the government prepared Thailand’s newest constitution, Banjob resurrected a decades-old push to have the religion enshrined in the constitution. Buddhism, he insists, must be protected. “We are very threatened by Muslims because Islam is a dangerous religion in my view,” he says. In addition to this “invasion,” Banjob complains about more quotidian problems with Muslims. More mosques are being built, he says, students have begun demanding the right to pray during the school day, and others break tradition (such as in the case of a college student who, on religious grounds, begged out of a postgraduation custom of paying respect before statues of King Rama V and King Rama VI). “I don’t know why Muslims are taught to be narrow-minded,” Banjob muses. In the deep south, I spoke to students who said they were aware of Apichart and concerned. “I’m afraid if the monks or Buddhists do [burn mosques] it will cause a problem. We’re all afraid religious conflict will happen and Buddhists and Muslims will kill each other,” says a 25-year-old religion student in Pattani province, who asked that his name not be used for safety reasons. That the government and some Buddhists have condemned Apichart ’s virulent commentary is heartening, say Muslim leaders like Samadi, but such vitriol is clearly spreading. On Facebook, Twitter and Pantip—Thailand’s most popular forum—Buddhist Thais are gathering in droves to discuss the “Muslim problem.” A Facebook page whose name translates loosely as “unmask the unpropitious scoundrels and guard virtues” posts a range of anti-Muslim propaganda, calls for boycotts of Halal foods and dire warnings on the fate of Thai Buddhists—all of it eagerly monitored by nearly 18,000 followers. Some 4,000 people have liked the Facebook page whose name translates as “ anti-extremist Muslims in three southern provinces,” which posts frequently and to gleeful reception from a decidedly anti-Muslim audience. Twenty thousand people follow a page called “Protect the Buddhist Country,” which has gained traction for a push to nix a planned Halal food industrial zone in Chiang Mai. All of which plays neatly in the hands of Apichart, who claims Buddhists across the country are lapping up his every word. When I ask him what his next step will be, he replies coolly, but my translator stammers slightly as she conveys the meaning to me.